There are so many things I love about summer. The lazy afternoons that roll slowly into evening and then night. Hours in the pool with my kids. The bounty of fresh fruits and vegetables. Mostly from my CSA. But I can't stand the heat of the kitchen. And so I usually avoid it. Not by starving my family (um, not usually). I just avoid turning on the oven. I cook mostly on the stovetop and grill, or serve raw foods. But I miss my roasted veggies and baked goods. And I especially miss homemade bread. That's why I was kind of excited when the temperature dropped this week. I fired up the oven and got to work on some homemade bread. This is my very favorite recipe. 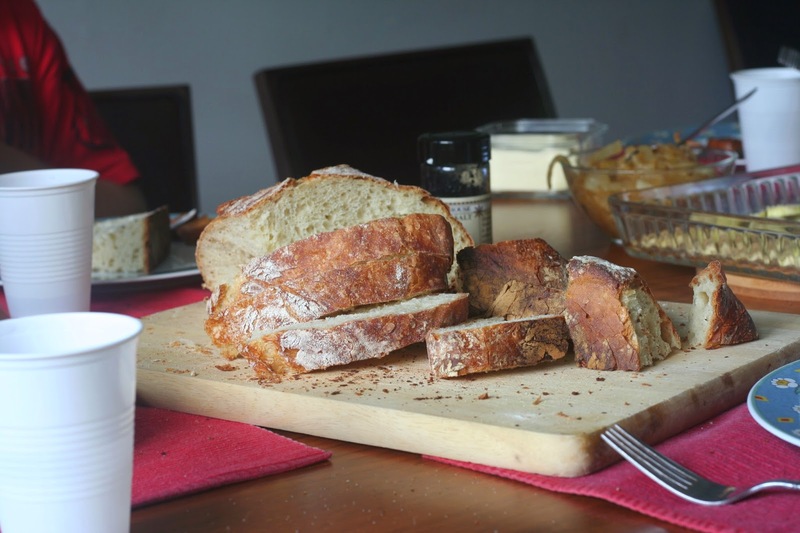 Although it does need 15-20 hours of rising, it's the simplest bread recipe I've ever made. 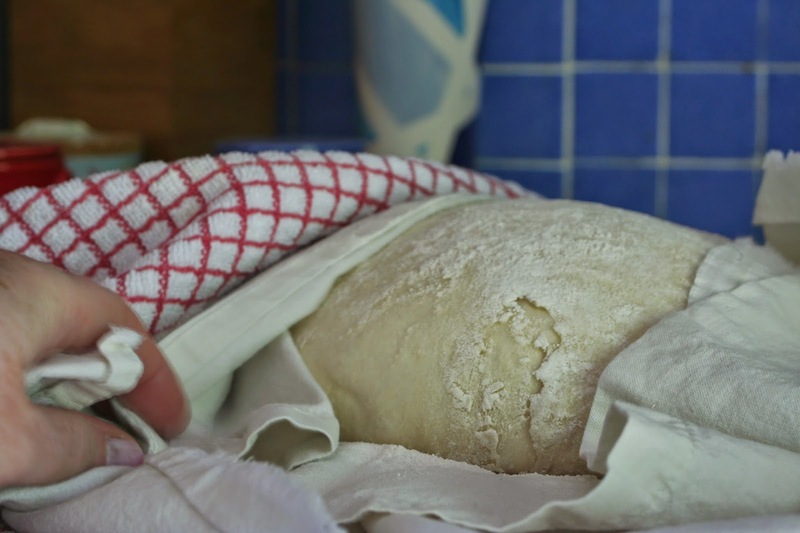 There is no kneading, no rolling, and almost no shaping. 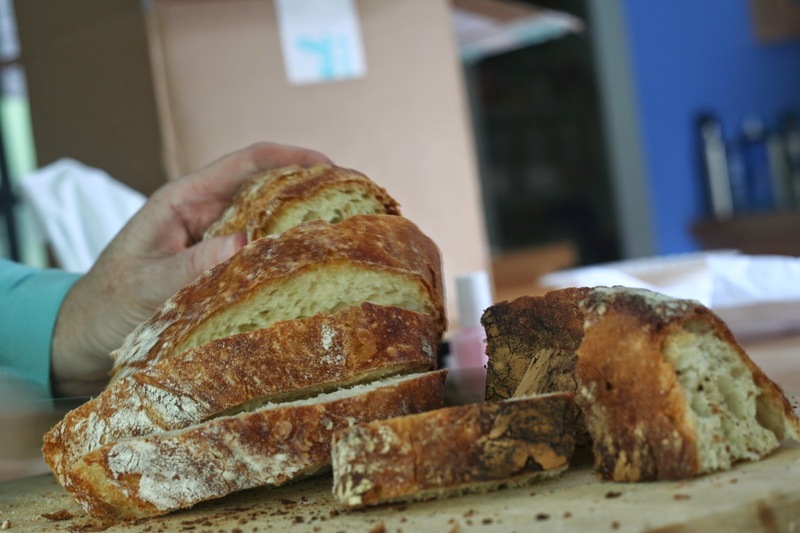 As long as you're somewhat organized, and home at key intervals, this bread is an absolute breeze. Like 5-10 minutes of hands-on time. Seriously. And, did I mention it's fantastic? And that it tastes like artisan bread? Yeah, it does. Oh, you'll need a big old oven-safe cast iron pot to make this recipe. Here's the one I use. It's AWESOME. 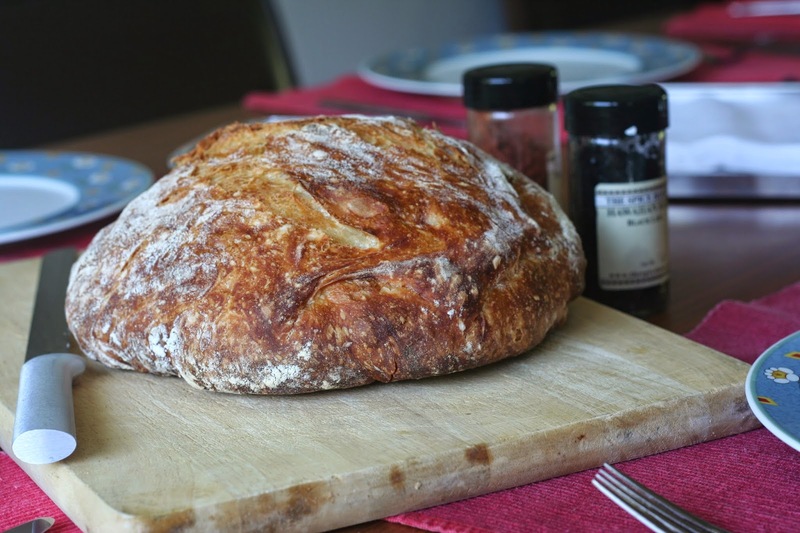 Jim Lahey's No Knead Bread, slightly adapted from the New York Times. Makes one generous loaf. Buy the book if you want to try variations. 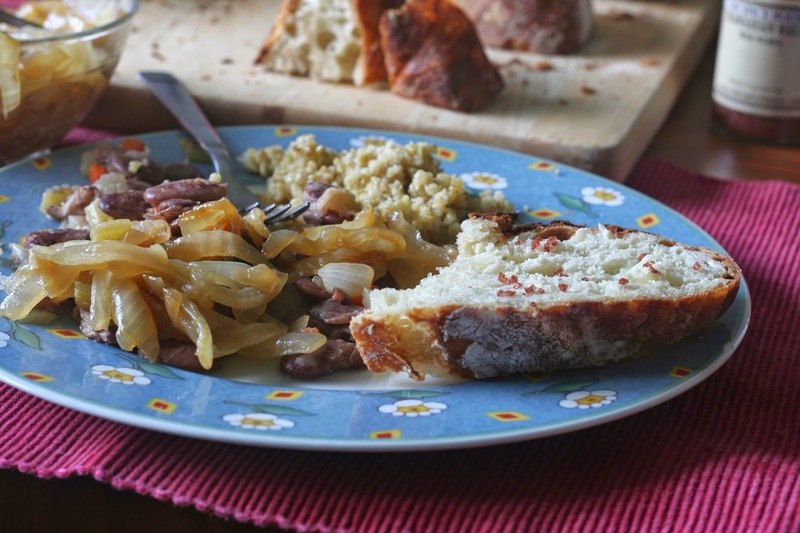 Get started on this recipe the evening before you want to eat the bread. If you want to eat it on Wednesday evening, do this first step on Tuesday evening. Use a wooden spoon to mix the flours, yeast and salt in a large mixing bowl. Add the water, and stir for a couple of minutes until the dough seems even. It'll be quite a bit stickier than other bread recipes you might be used to. Cover the bowl with saran wrap and let it rest in a warm room for anywhere from 12-18 hours. Move onto this next step when the dough is spotted with little bubbles. This can happen anywhere from 12-15 hours after you've put it up. Dust a counter or cutting board (for easier cleanup) with flour. Dump the dough onto it, giving a nudge with a spoon if needed. Sprinkle the dough with some more flour and fold it over on itself a couple of times. Cover the dough with saran wrap and leave it to rest for 15-30 minutes. Spread out a clean cotton cloth on your counter. (I use an old - washed - pillowcase. The original recipe says NOT to use terry cloth.) Flour it generously and then quickly shape the dough into a ball, using a tiny bit of flour if the dough is sticking to your hands. Put the dough seam side down on towel. Dust your dough-blob with more flour. Cover it with another cotton cloth and let it rise for anywhere from 1½ - 3 hours till it's doubled in size. Half hour before you plan to bake it, preheat the oven to 450*. Put a 6- to 8-quart heavy covered pot (I use this one ) in the oven to heat up. When you're ready, put on a thick pair of hot gloves and remove the pot from the oven. Carefully turn the dough over into the pot, seam side up. Cover the pot with the oven-safe lid and bake the bread for 30 minutes. Remove the lid and bake it for another 20-30 minutes, until the loaf is beautifully browned. Cool on a rack before devouring.